We once had a call from a local customer who complained that her reverse osmosis storage tank took up too much space under the sink but didn’t hold enough water. We promised to look for a tank that was larger on the inside than on the outside, but we still haven’t found it. Here’s one manufacturer’s estimate of what you might expect in terms of real water delivery from each state tank size. These are averages, not promises. In our opinion, even these estimates are a bit high for most customers. Our rule of thumb is to assume about half the manufacturer’s stated size. If you need two gallons, get a four gallon tank. Another point to consider is that you usually don’t need as much water as you think you will at one time. If you draw a gallon from your “four gallon”; tank, the RO unit begins at once to replace it. Also, if you need more than the standard tank holds, it’s usually easier and more economical to add a second small tank rather than replace the original tank with a larger one. Hooking two tanks together is easy. 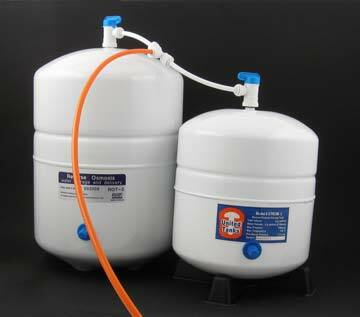 You can add storage capacity to your RO unit by simply teeing two standard tanks together. They don’t have to be the same size. We don’t guarantee capacity. There are just too many things that affect capacity that are beyond our control. This article is reprinted from purewaterproducts.com.